With so many free streaming choices available to music fans in the U.S., some services are struggling to find an audience. On a given day, the average online music fan can hop from their personal library on Google Play Music, to Pandora radio-like tunes, to the on-demand listening of Spotify and Xbox Music—all without paying a dime. That plethora of options is why subscription service Rdio is expected to launch a free, ad-supported tier before the end of 2013, thanks to a new partnership with Cumulus Media, the second-largest radio station operator in the U.S.
“The biggest challenge we face is really awareness,” Rdio head Drew Larner told the New York Times, as Larner feels few mainstream users are really aware of streaming music services. Unlike competitors such as Spotify and Xbox Music, Rdio currently doesn’t offer a free, ad-supported version of its service. Rdio does offer new users a limited trial for up to six months, but the service’s trial doesn’t have ads and is not a complete service the way Spotify’s free tier is. So instead of a mix of ad and subscriber revenue, Rdio relies exclusively on paying customers who shell out anywhere from $5 to $18 per month to listen to ad-free music. 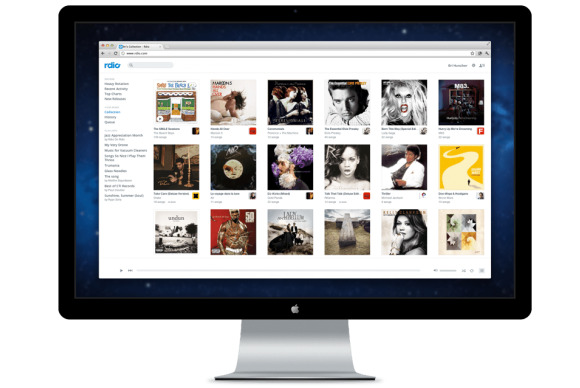 Cumulus also plans to bring some of its own programming to Rdio. The problem is that Rdio is believed to have a very low user base compared to Spotify’s more than 24 million users, 6 million of whom pay for a subscription to the service. But soon ads—and freeloading listeners—will come to Rdio thanks to an agreement between Pulser Media, Rdio’s parent company, and Cumulus Media. As part of the deal, Cumulus will sell ads for Rdio, and Cumulus will get a “significant equity stake” in Pulser. Bringing yet another ad-free music streaming service into the U.S. with essentially the same catalog as its competitors, however, won’t be enough to help Rdio stand out. So Cumulus also plans to bring some of its own programming to Rdio, the Times says. Cumulus wants to create Rdio playlists based on local and syndicated shows across its radio network—dropping local content like news and weather before hitting Rdio. It’s not clear from the report if any of these shows would be streamed live or if free users will have access to Cumulus content. There could be more integration to come as the online and terrestrial radio companies team up. Cumulus sees the deal as the company’s major move into the digital space, giving the company freedom to try out new ways of monetizing its existing business. Beyond free streaming, Rdio is also trying to go toe-to-toe with Spotify in other ways. On Friday, both services added Twitter Music playlists to their app arsenals.